Baxter celebrated World Prematurity Day in a dozen countries, engaging hundreds of employees. They set up a global neonatal symposium, launched a campaign where colleagues shared their NICU story, and organised fundraising events in their branches worldwide. Switzerland: On November 20, Baxter EMEA celebrated the 10th Anniversary of World Prematurity Day. Cristiano Franzi, SVP & President EMEA, opened the celebration by sharing his personal experience as a father of a preemie. Benelux: The Specialty Care Team of Benelux and the team in Lessines celebrated World Prematurity Day raising awareness on the impact on lives of preterm infants and Baxter’s end-to-end solutions enabling healthcare providers to be there, at that critical moments that matter most. We showed the patient video of Elias now 2 years and shared the story of Jules a healthy boy of our Belgian colleague. 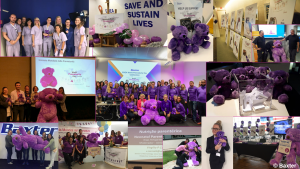 France: The Team displayed the giant purple teddy bear in Baxter France HQ in Guyancourt to remind employees of what Nov 17 is and how Baxter is committed to this patient population. They also took this opportunity to highlight their 2018 local partnership with SOS Préma, the French counterpart of EFCNI (Baxter France corporate donation + “Course des Héros” employee fundraising). Italy: Italy organized a teddy bear raffle during the Rome Employee Meeting. Congrats to their colleague in Customer Service who won the bear. She donated the bear to the Bambin Gesu Hospital – Oncologic Department! Spain: In Spain, Baxter organized a raffle to draw the big bear, and involved all of Baxter’s locations throughout the country. From Madrid, Valencia, Sabiñanigo and the RTS centers. The winner was announced on World Prematurity Day. Portugal: They celebrated World Prematurity Day through the Neonatal Parenteral Nutrition Conference in the Neonatology Portuguese Society Congress with Prof. Virgilio Carnielli. Prof. Carnielli focused on Parenteral Nutrition being an essential therapy for optimal growth and development of pre-term babies. He also discussed the new 2018 ESPGHAN/ ESPEN guidelines. UK: They used the November town hall briefing to raise awareness, and encourage people to think about stories to share next year and held a stand outside the cafeteria, which included Numeta products as well as information on Bliss, who they hope to support again next year. Poland: Lecture from Dr. Krystyna Bober-Olesińska MD, “Innovative nutrition therapy in preterm infants” and Lukasz Petrykowski, Baxter “Numeta in Preterm Infants Therapy”, as well as a knowledge Quiz by Michal Maciazek ’’Clinical Nutrition for Preterm Infants” – with Bears and WPD Shirts to win! Colombia: On Friday, November 16th, the Nutrition team celebrated for the first time the World Prematurity Day in Baxter’s offices. In this day the workers were sensitized in the high incidence of prematurity in the world, as it was also evident that in Latin American countries the rates are higher. Hong Kong: Purple teddy bears are displayed in office showing our commitment in save and sustain babies’ lives.